Vintage Beachwear around 1900. Art Nouveau period fashion. Home » Vintage Beachwear around 1900. Art Nouveau period fashion. Vintage Beachwear around 1900. Belle Époque, Art Nouveau period fashion. 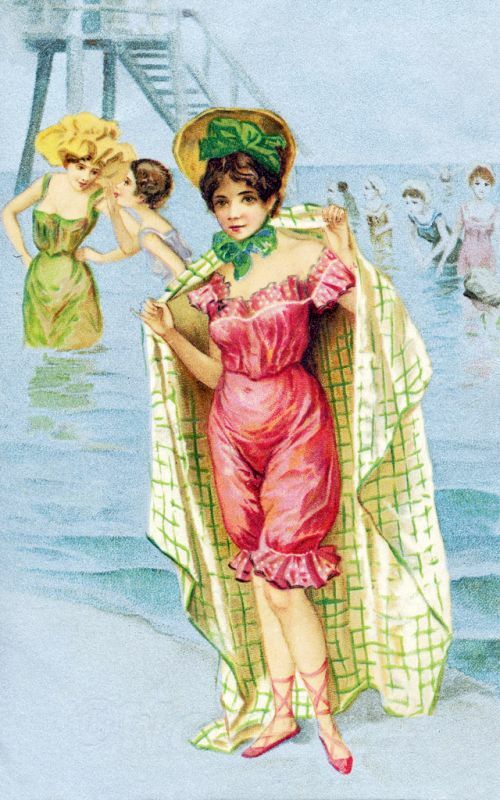 Tailored bathing suit, beach wardrobe to the turn of the century. The swimsuit was worn knee-length and was filled with frills and flounces. The material was mostly calico, a sleek and compact cotton fabric, color printed or woven. Usually a corset was worn. A large bathing cap or hat against the sun, all sorts of Zirat, shoes completed the morally acceptable beach attire for women. It was wading in the main in the water, swim was the exception, and was also given the severity of the clothes, ill-advised. This period was marked with dress codes to the moral decline should stop it. Especially in Prussia did Regulations forth over the length of the female swimwear and behavior at public beaches. This entry was posted in 20th Century, Art Nouveau, Hairstyle, Headdresses, Swimmsuit and tagged Belle Epoque Fashion on 4/11/13 by world4.